Jules Verne first published From The Earth to the Moon, or De la Terre à la Lune, in 1865, pre-dating our first real visit to our lunar neighbor by over 100 years. It involves a post -American Civil War group called The Baltimore Gun Club firing a three-person capsule from an enormous gun. The goal: to get them to the Moon, although it would have been a one-way trip. Is trying to fire people into space crazy? Check out the some little known facts about the book, the real life efforts to do the same, and the impact it's had on science fiction, in the triviagasm below. In Verne's story, the cannon that fires the passengers into space is called the Columbiad. More than 100 years after this book was published, the ship that sent the astronauts to the moon in the Apollo 11 mission was the Columbia. There are other correlations to the Apollo mission: in both cases there were three travelers, both ships blasted off (literally, in Vernes' case) from Florida, and the dimensions of the "shell" are very close to those of the Apollo Command/Service module. The French adventurer Michel Ardan in the novel was inspired by the French photographer, cartoonist, writer, and balloonist Gaspard-Félix Tournachon. He was the first person to take aerial photographs, and inspired the Verne novel Five Weeks In A Balloon. 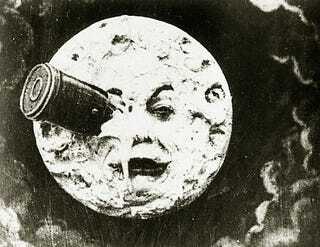 In 1875 the novel was adapted into an opera, "Le voyage dans la lune." Although this was done without Verne's permission, it featured an enormous budget with music by Jacques Offenbach, huge palaces built out of glass, a live camel, and 673 costumes. Verne approached the creators of the show and complained to them that it was similar to his novel, and they apparently settled the matter, because the same team later adapted Verne's short story anthology Doctor Ox into an opera as well. Verne did his own rough calculations on what it would take to shoot something into orbit for this novel, and they turned out to be fairly close to the real thing. If Verne had lived in the 1950s and 1960s, who knows what would have happened. In the novel, when constructing the cannon, they have to dig a hole 900 feet deep, and 60 feet wide, to house the barrel. That's pretty damn big. Although the projectile is actually fired in this novel, the fate of the astronauts aboard is unknown. Verne later wrote a sequel called Around The Moon which details their trip which involves orbiting the moon, and somewhat impractically falling back to the Earth and being rescued. This book inspired the first science fiction film ever made: Georges Méliès' A Trip to the Moon, in 1902. Later adaptations included From The Earth To The Moon in 1958 from RKO Pictures, and a comedy with Burl Ives and Terry Thomas in 1967 called Jules Verne's A Rocket To The Moon. In 1961 ballistics engineer Gerald Bull began Project HARP (High Altitude Research Project) which fired very large projectiles into the sky, with the hopes of them one day attaining orbit. This would be much cheaper than using rockets, although the project was ended before they could get anything beyond the Earth's atmosphere. Bull kept trying to work on his idea to launch a satellite into space via a gun through the 1970s and 1980s, and produced an enormous gun based on his work called the GC 45. It fired 155 millimeter shells over vast distances, and was purchased by both South Africa and Iraq. Bull continued to work with the Iraqis on the design of the supergun, but was assassinated in 1990, most likely by Mossad agents, as Israel would have been the target of that gun. During the U.S. military's Operation Plumbbob series of nuclear tests in Nevada in 1957, a 900 kilogram steel plate covering a safety shaft was sent shooting skyward at enough speed to attain escape velocity, and it was never found again. Some researchers think that it broke the Earth's gravity and is in space somewhere, but others believe it melted in the upper atmosphere. When Disneyland Paris was designed, the Imagineers drew heavily on the French love for their native Jules Verne, and as a result Space Mountain was built as an homage to this book. In fact, there's an enormous cannon mounted on the building, which is meant to "fire" tourists into space. Inside the ride you pass by the Columbiad which fires and recoils as you pass it. Logos for the Baltimore Gun Club and the Columbiad Cannon are visible throughout. Additionally, the ride lies right next to the attraction inspired by Verne's 20,000 Leagues Under The Sea. A verneshot is a geologic term where a hypothetical volcanic eruption caused by a buildup of gas deep underneath the Earth's crust could launch parts of the crust and mantle into orbit. It's named in tribute to both Verne, and From The Earth To The Moon. Warren Ellis' excellent Planetary comic book features many homages to classic literature, including the discovery of the shell fired by the Baltimore Gun Club (now the American Gun Club). However, in Ellis' story there was a miscalculation in the trajectory, and the shell orbited the Earth for years before crashing back to Earth, and the astronauts aboard died due to lack of food and water. In 2005 a video game called Voyage: Inspired By Jules Verne was released, based on this novel and its sequel, and The First Men in the Moon by H.G. Wells. It's set in the year 1851, and you play the part of French adventurer Michael Ardan who travels to the Moon aboard the shell. The story then deviates from Verne's work, having Ardan meet an entire civilization that lives under the surface.